My travel plans after Korea (T-4 days) are to fly to China and take the train from Beijing through Mongolia to Russia on the Trans-Siberian route and from Russia through Europe to London. 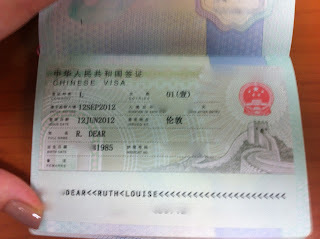 In order to take the Trans-Siberian I needed visas for China, Mongolia and Russia. Once in Europe I've decided on a route to England that excludes Belarus (visas start at £100) going through Ukraine, Poland and Germany which are all part of the EU zone. Living in Korea made arranging and applying for these visas more difficult than back in the UK. The first one I tackled was the Chinese. Already being aware that they are incredibly strict and change the rules almost monthly. In May, after researching online I'd found out that the recent rule changes meant foreigners within Korea couldn't apply for a visa without at least 6 months remaining on their residence cards. BUT a few people had discovered a loop-hole by using a travel agent in Itaewon and sending their passport to Busan. When I visited however they told me that the rules had once again changed and now it was impossible. My options? Either don't go, or send my passport back to the UK and apply there. This is the procedure I was forced to take. So I sent all of the documents by EMS. I was worried about this but through the EMS service it is possible to track your parcel online and I even knew who'd signed for it at the final destination (my neighbour!) From then on my mum sorted everything. Sending my documents registered post and including a registered self-addressed envelope she sent it to the China Visa service in London. They returned it within the same week because I hadn't included my round air ticket and the confirmation of where I'm staying. Obviously I hadn't booked these yet because I didn't have a visa but I had to duly book everything and emailed to my mum. Second time lucky they processed and sent back my passport. Then my mum sent the passport back to Seoul. It was an expensive exercise, especially as I my mum had to pay for registered post twice (total £24). The total cost for the visa + visa service was £60. The Russians have a similarly awkward reputation and it was that visa that I tackled next. The Russian consulate in Seoul is at City Hall station (exit 10). I trotted along with my 'invitation' and itinerary (provided by the Trans-Siberian agents we used). After messing up the queueing system (I'm used to the Korean system of picking up a ticket now) I finally reached the window and the guy behind the counter tells me that visa selection is only in the morning session (9.30-12) and besides I have the wrong form anyway. So I picked up the correct application form (for British, US and Canadian citizens) and went on my merry way. A week later I managed to get the morning off work and went again. This time they accepted my application and the cost was significantly lower than my friend had paid in London (80,000 won). A week later I picked it up with no problems in the afternoon. And so, for the last; Mongolia. Which I thought would be the most straight forward. I checked the info online and the Mongolian consulate is at yongsan (line 1) or sinyongsan (line 4) and the instructions looked pretty straight forward. I know that area a little bit so I thought there would be no problems. But when I went to find the place I couldn't see it anywhere. Following the map and looking for a tall building (as pictured on the map) on one of the hottest days of the year I walked up and down, up and down. Sweaty does not even describe it! Finally, I asked in an office block and the security man rang the consulate but our language barrier proved too large and I had to return after unsuccessfully walking up and down again to get him to draw the correct location onto my map. When I FINALLY arrived the service was quick and easy. I had to pop into the bank next door to transfer 42,000 won to the Mongolian account and then I was to wait 2 days for processing. The entrance to the Mongolian Consulate. If you're looking for the Mongolian Consulate it's between a GS25 and Hyundai Swiss bank. On the 5th floor, of a 6 storey building -not a skyscraper as pictured on their map. I hope the info on this page can help anyone else who is trying to apply for any of these visas. If anyone needs any clarification about these three applications just leave me a comment and I'll try my best to offer any help! Hello! In your photo of your Russian visa, there's no photo of you. My visa was sent to me this way, too. I'm leaving tomorrow morning and just wanted to confirm that my visa is not supposed to have my photo on it. Is that the case? thanks! I don't know if it supposed to have a photo - my parents had photos on their visas a few years ago. As you say, mine came this way and I had no problem getting into Russia from Mongolia with the visa shown here!